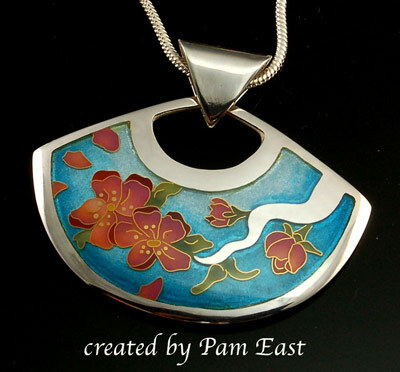 Enameling is the art of fusing powdered glass onto metal to create designs. It is one of the oldest methods used to decorate metals. This powder is applied, by one of several methods, to the metal surface an then torch or kiln fired. Metals may be worked - etched, chased, formed, etc. - before any enamel is applied. Enameling is characterized by brilliant, non-fading colors, tremendous durability, variety of color effects depending on angle of light, and versatility - from jewelry such as cloisonné, a type of enameling, to bowls and wall pieces. Both copper and silver fired metal clay can also be enameled using the same techniques. Metal should be clean and free from grease for enamel to adhere. Because enamel expands and contracts at a different rate from metal, it is often necessary to counter-enamel the back of your piece to avoid chipping and cracking on the front. Also, if a piece is not count-enameled, it tends to bend backwards or warp if the metal is too thin. Transparent cold colors look best on silver and warm colors on gold or gold foil. Reds and pinks tend not to work on silver, however; silver foil can be used with a clear base coat to achieve a more desired color. Keep each coat thin, usually three coats depending on your project. Putting on one thick coat can result in clouding and bubbling. An overabundance of very fine particles or dust in transparent enamel may cause cloudiness, especially in wet-packing techniques. Washing the enamel will remove these very fine particles. This is accomplished by swirling 80 mesh enamel around in water. Allow the enamel to settle and pour off the particles that are suspended in the water. Another option to remove the "fines" is to screen out the fines from 80 mesh material with a 325 mesh screen (not recommended for lead bearing enamels). The advantage to this method is that the fines can be saved and used for counter enameling. Every combination of metal and enamel will have their own unique properties, some good, some not so good. Most metals in general can be coated with enamel. This does not mean an enamel selected at random can be used successfully on a randomly selected metal. The enamel, technique of application, and firing conditions must be carefully selected the metal chosen. If you are interested in more details regarding metal types and enameling, The Thompson Enamel Workbook includes in depth information on this topic. Basse-taille (pronounced bahss-tah-ee) is an enameling technique in which the artist creates a low-relief pattern in metal, usually silver or gold, by engraving or chasing. Pronounced shahn-luh-vey. Medieval enamelers used several different techniques but champlevé enameling was one of the most common. The word champlevé means literally 'raised fields' and refers to the way that beds were dug out of a copper plate to receive the powdered enamel. This method is still used today in jewelry making. Cloisonné (pronounced cloy-zon-ay, French for ”partition”) is an ancient metalwork technique that makes use of small, precious metal filaments and colorful glass enamels to create brilliant artwork. The metal wires are bent into shapes to create small cells, (partitions) of designs, and many coats of finely ground glass enamel are fired into them until one unique piece of art is rendered. Cloisonné is commonly used in jewelry making. Plique-à-jour (French for "letting in daylight") is an enameling technique where the enamel is applied in cells, similar to cloisonné, but with no backing in the final product, so light can shine through the transparent or translucent enamel. The effect is similar to the look of stained-glass and is considered very challenging technically. The technique is similar to that of cloisonné, but using a temporary backing, such as mica.